Carlos Beltran, one of the best switch-hitters of his generation, found nearly unparalleled success in the postseason which earned him the nickname, "New Mr. October." He debuted on major league trading cards in 1995, three full years before he would see any MLB action. Highlighting rookie cards and notable prospect options, review some of the best Carlos Beltran baseball cards to collect. 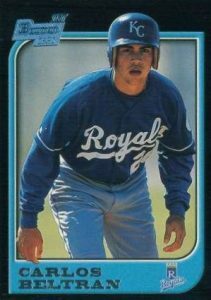 Drafted in 1995 by the Kansas City Royals, Beltran played only a few games in 1998 but would go on to grab the AL Rookie of the Year Award in 1999 with a .293 batting average alongside 22 home runs and 108 RBI. Beltran also became a member of the 30-30 Club when he hit 38 homers and stole 42 bases in 2004. An excellent outfielder, he notched three consecutive Gold Gloves (2006-2008) with the New York Mets. Beltran's career was spread across many teams, but a constant throughout was his success at the plate in the playoffs. He retired in 2017 after winning a World Series with the Houston Astros. Also a mainstay on the Puerto Rican national team, he has appeared multiple times in the World Baseball Classic. 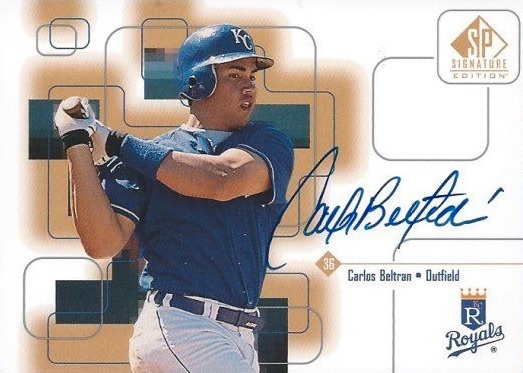 Shop for Carlos Beltran autograph cards on eBay. Early Carlos Beltran insert cards that attract high prices on the secondary market include 1999 Pacific Crown Royale, 1999 Bowman's Best, and 1999 SPx. Beltran was also featured on a super short print in 2014 Topps Heritage, which honors the 1965 Topps set. Beltran's card features a "printing error" making his name the same color as the background. As Beltran has been a very limited signer in recent years, fans will need to focus on through-the-mail or in-person autographs for more timely options. He did sign a few cards for 2008 Topps that celebrated the company's 50th anniversary. Beltran's autograph honored his AL Rookie of the Year selection from 1999. 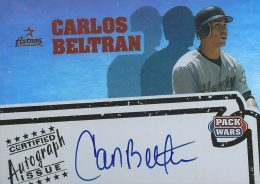 Another notable Carlos Beltran autograph can be found in 2004 Ultimate Collection where he is paired with Ken Griffey Jr.
At this point, Cooperstown is still not a lock for Beltran but he is certainly in the conversation. The call from the Hall of Fame would certainly boost interest in Carlos Beltran cards. In putting together this list, emphasis was placed on Beltran's earliest baseball card appearances as well as card value. 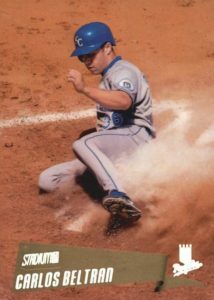 My personal favorite Carlos Beltran card can be found in both 2000 Topps Stadium Club and 2000 Stadium Club Chrome, as he is shown sliding across home plate in a cloud of dust. The Stadium Club Chrome set includes Refractor and First Day Issue parallels (#/100), and there is even a First Day Issue Refractor that only has 25 copies. The reverse side highlights Beltran's Rookie of the Year season with statistics that are on par with Joe DiMaggio's first year. 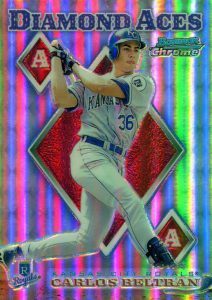 1999 Bowman Chrome offers an early Carlos Beltran insert as part of the Diamond Aces set. You might expect an insert with the name Diamond Aces to focus on star and up-and-coming pitchers, but the name instead refers to playing cards. In total, 18 players were included with nine new players and nine established stars. Along with the standard Chrome version, a Refractor version is also available. Since 2005, Beltran has only signed certified autographs for a handful of sets with each limited to very small numbers. This makes his 2005 Topps Pack Wars autographs one of his last options found in any decent number. Beltran is featured as a member of the Houston Astros where he was traded by the Royals in 2004. The Pack Wars set was a high-end release with each pack featuring either an autograph or relic card. As an odd promotion, Topps also placed $100 bills in packs for some lucky rippers to discover. Given the way card makers issue the first cards of prospects and draft picks today, it feels odd that the 1990s minor league cards were frequently issued after their first major league baseball cards. 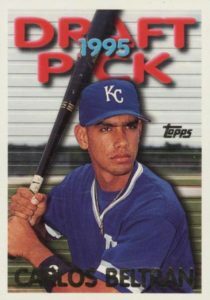 This was the case for Beltran, who had cards with Topps and Bowman in 1995 and 1997, long before some of his minor league cards arrived, including his appearance in 1997 Best Carolina League Top Prospects. 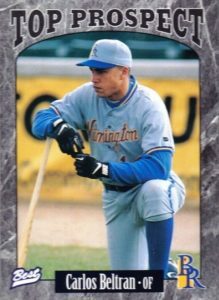 Beltran was playing with the Wilmington Blue Rocks at the time, which was the Royals single-A team, and the card back mentions that Beltran was considered the second-best prospect in the Royals organization. After not being included in any releases from Topps, Bowman, or Upper Deck in 1996, Beltran returned to Bowman's Best in 1997. The set features 200 cards broken down into 100 of the league's best players and 100 of the best future prospects. Cards are easily differentiated as the stars have a gold background and prospects have a silver background. Rookie collectors put a high premium on the Refractor and Atomic Refractor versions of the prospects in the set. 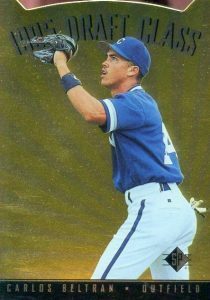 Beltran would debut for the Royals in September 1998 and assumed full-time centerfielder duties the following season. Beltran's image in 1997 Bowman is the same as 1997 Bowman's Best but the overall design of the card couldn't be much more different. Beltran's black-bordered card is listed as being his "1st Bowman Card," but as you'll see with card #4 below, that statement is not altogether accurate. Along with the standard base card, an International parallel is available that includes the flag of each player's home country displayed in the background. In the case of Beltran, this edition includes the flag of Puerto Rico. Topps also tried an interesting experiment by guaranteeing the set value to be at least $125 through 2000. Notably, Topps did not continue this practice. 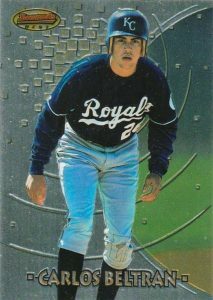 1995 Bowman's Best is the first of three Carlos Beltran cards from 1995 on the list. To be honest, though, it is actually a card for another Royals prospect, Juan LeBron, who was confused for Beltran on several Topps cards (much more on that at card #2 on the list). 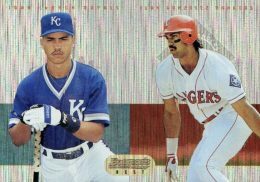 Beltran (or really LeBron) is teamed with Puerto Rican slugger Juan Gonzalez as part of the Mirror Image insert that combined a star with a prospect whose career might have a similar trajectory. Thanks to the striped background design used on the Mirror Image cards, you might not even realize that Beltran was included in error until you turn over the card and it mentions that Gonzalez shares the same first name as Beltran/LeBron. For the first time, Upper Deck put minor league players into an SP-branded set with 1995 SP Top Prospects. Although UD placed the top prospects of the day in the first 10 cards of the checklist, Beltran was included in the 1995 Draft Class subset that featured 15 recent draftees. 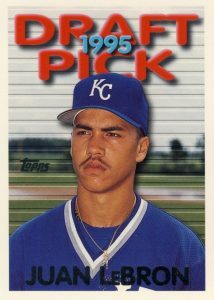 A superstar's rookie card typically leads their top list but Topps really messed up Beltran's first major league appearance in 1995 Topps Traded. Beltran's photo was used for Royals prospect Juan LeBron's rookie card and LeBron is featured on Beltran's card. Both players are from Puerto Rico and they were both selected by the Royals in the 1995 draft, so the mistake is almost understandable. A longtime minor league player who never made it to the majors, LeBron remains part of hobby lore thanks to his Topps debut. As a result, collectors have a reason to pick up two Carlos Beltran rookie cards from 1995 Topps Traded. Another personal favorite of mine, one of the first Carlos Beltran autographs came in 1999 SP Signature Edition. Beltran's blue-ink autograph works nicely with the blue of the Royals jersey and his signature is notable for the over-sized "C" in Carlos. Another frequent addition is the acute accent that would typically go over the "a" in "Beltran," but is often placed floating to the right.